Hi scrappy friends! I used the cut file called My Heart. I only use the word "Heart" and copied it unto my page 5 times, staggering them and then welding them together. This is what it looked like in my software.I used plain white smooth card stock. I decided I wanted to do some backing. 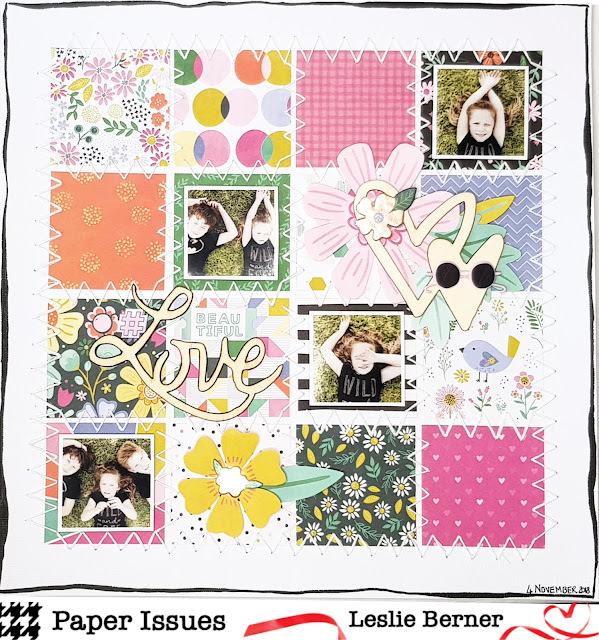 and backed three of the "Heart" words with patterned paper from the Paige Evans Whimsical collection. I backed the first, third and fifth word. The rest went pretty quickly, I fussy cut one of the big floral clusters from one of the other patterned papers from the collections and nestled my photo between the cut file and the floral cluster. Next, I scattered some of the enamel shapes around the layout and added some small chipboard pieces that fit into the little open spaces. 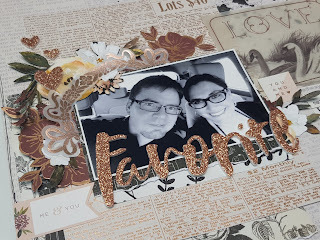 Lastly I splattered some black Heidi Swapp color shine in the top right hand corner and added a roughly drawn border around the edge of the layout. If you are interested in watching the Process Video for this layout here is a link to my channel, Leslie Berner. 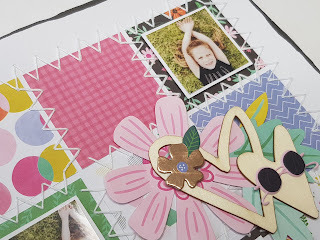 Today I am sharing this layout with you that I made using the Candy Hearts cut file. I all of the hearts out of textured white card stock using my silhouette cutting machine. I only ended up using 4 of the hearts. I firstly coloured each heart with Copic maker number E00, and then realised that I wanted something more pink, so I got out my light pink Sharpie and coloured over the Copic marker, that did the trick. To draw more attention to the hearts, I chain stitched around each heart. The collection I used is Romance from Simple Stories. I did quite alot of work behind my photo, I dropped some black ink splatters and splattered some Heidi Swapp black color shine as well. I then fussy cut some of the flowers from one of the patterned papers from the collection to layer behind the photo. I used a cut apart sheet and cut apart all the elements and layered that behind the photo as well. Today I am sharing a layout with you that I made for a new series Becky Bitting and I are hosting on YouTube. We are super stoked about this and hope that this series will inspire you and help you to use those older supplies in your stash. Each week we will be challenged by you! We ask that you leave suggestions of products, tools or papers that you would like to see us use in our next weeks videos. This is such a fun way of interacting with you and it also challenges us to make layouts that are sometimes way out of our comfort zones. This week we had to use ribbon, glitter and stamps. I have to admit, I was a bit stumped with the whole glitter thing, I recently destashed my glitter, so I had to borrow some from a fellow scrappy friend. I had this great idea of taking small wood veneer hearts, painting glue on them and then dipping them in the glitter. It worked like a bomb! It added such a striking yet simple effect to my layout. Next, I had to use stamps. I had tried this technique before, and was ready to give it another shot. I used my VersaFine Onyx Black ink to ensure a crisp stamp. I love my VersaFine ink pad, I use it for everything! 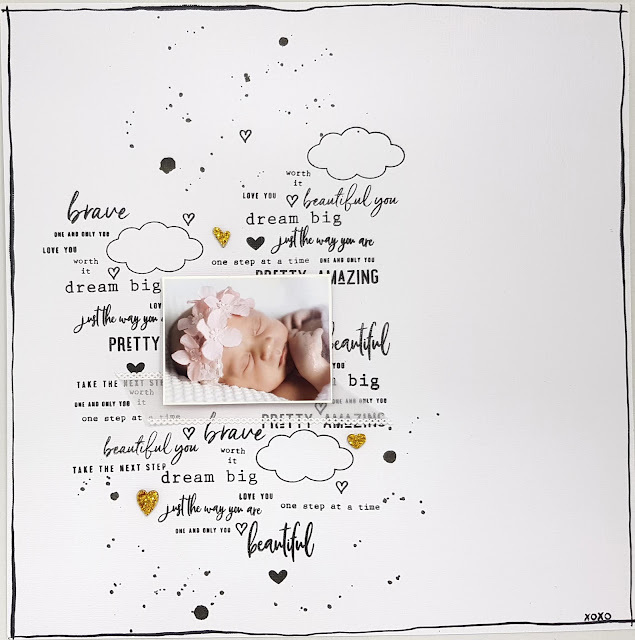 I traced the area on the page where the photo would be going so that I would know where to not waste any precious stamping. I then pulled out my Felicity-Jane stamp sets and let rip, I basically used all the sets that had a positive affirmation or phrase. I stamped them all quite randomly around the area I knew my photo would go. I also was not shy to stamp a phrase or word two or three times. The next item I had to use was ribbon. Now I have to admit, this stumped me a little. I had no idea how I would incorporate a ribbon in a soft and subtle way onto this very light and whimsical layout. I had a bit of white translucent ribbon with thin white scalloped edges in my stash and I thought this would be the best ribbon for the job. So as understated as I could possible do it, I trimmed the ribbon just slightly shorter that my photo and layered in under the bottom edge of my photo. I was in love with the effect it gave, very understated, yet visible. And please don't forget to subscribe, that way you will be able to see all the new layouts I create. Hi everybody, thank you for stopping by today. 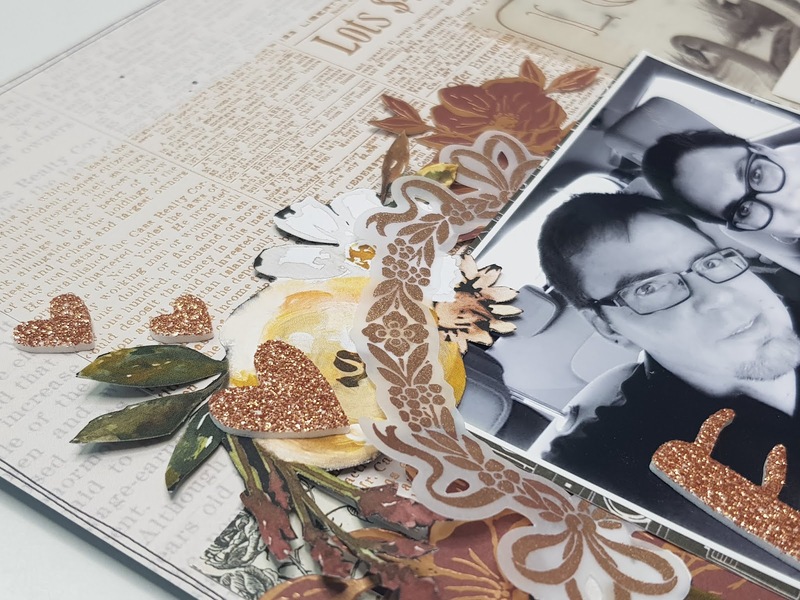 I am back with another layout using one of the beautiful cut files from the JustNick cut file shop. I used one of the new releases, Doily 2. I cut the shape out of textured white card stock, large enough to fill a 12x12 page. I used the Jillibean Soup Collection, Garden Harvest and fussy cut the flowers out from one of the patterned papers. I also did very little mixed media on the background, using Heidi Swapp Color Shine, Butter, and splattered some yellow onto the background, making sure that I stick as much as possible to the edge of the page. I obviously wanted the cut file to be the main focus of the layout, so I layered the flowers and other embellishments behind it. To give the cut file some extra weight, I took out the two center stars and backed the center with some of the pattered paper from the collection. I love the pop of dark blue as my baby girl is wearing a similar color blue. If you would like to watch the process video on my YouTube channel please click Here. Please don't forget to subscribe to my channel and hit the bell icon so you would be up to date with all My newly released layouts. SLS Week 5 - Hey, it's your day! Hi! Thank you so much for stopping by today. It's Leslie on the blog today! I get to scraplift Debbie today! Here is the beautiful layout I get to lift. So I decided to stick to the original pretty closely. I absolutely love this layout. I used the Hooray! collection from Crate Paper. I used one of the patterned papers from the collection as my background and just turned the paper on it's side so that the stripes are vertical and I used this as a base for the majority of my embellishments. I also used four photo's and stacked them and added a photo strip behind them. I have been wanting to make a shaker pocket banner for months now and I thought that this layout would be the best to try it out on. So I took some tracing paper and cut triangles and stitched two of the sides with my sewing machine, then I added some sequins from my stash and stitched the third side closed. The rest is pretty self explanatory, I layered some embellishments from the ephemera pack and the chipboard sheet. I also fussy cut the month of March out of the one cut apart sheet form the collection and layered it behind the bottom right of the photo's. I added an arrow below the word March and circled 23, as it's the day of his birthday. 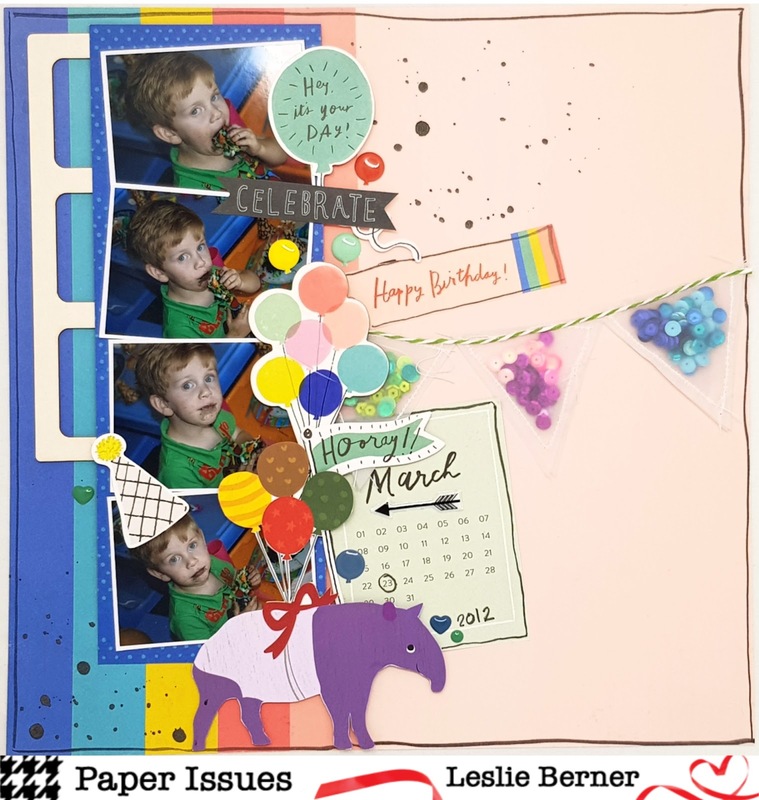 Lastly I added some enamel balloon shapes around the photo's for some extra interest and texture and also used some Heidi Swapp Black Color Shine to the top right of the photo's and the bottom left. The stinking cute Aardvark attached to the balloons I fussy cut from a party banner I bought months ago at my local dollar shop. If you are a stickler for Process videos, please click here to watch this layout come together. Today I'm sharing this layout that I made for the "As the world turns" challenge. I have been wanting to use this beautiful cut file from the shop for a long time, and I finally got my chance. 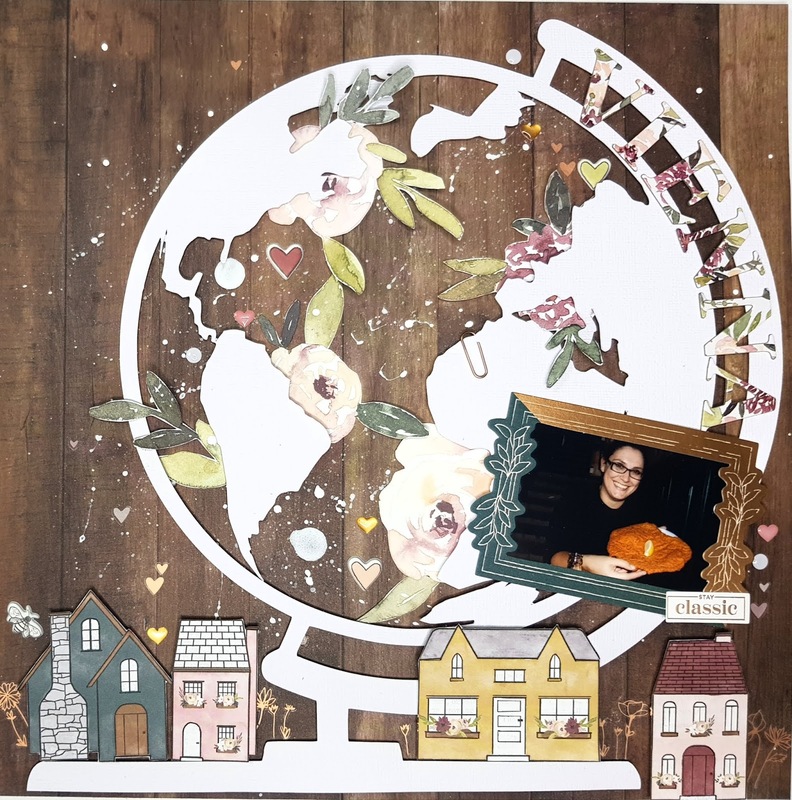 I felt that this globe cut file would be the perfect focal point in a layout, especially for this challenge. I did not change the cut file one bit, I used it as is and cut it out of American Crafts textured white card stock. I chose to use the "Auburn Lane" collection from Pink Paislee. I felt that the colours in the collection match the colours in my photo perfectly. I didn't want to change my photo to black and white, the Schnitzel would look like a big grey blob, so I kept it coloured. I did a load of fussy cutting as well. I used two of the 12x12 patterned papers and fussy cut some flowers and 4 of the little houses. I decided that I wanted some interest on the background, so I splattered some white acrylic paint. I also used a lot of the tiny rub-ons. I love how easily they rubbed on! I scattered the rub-ons haphazardly around the page, I wanted them to look like little sprinkles. 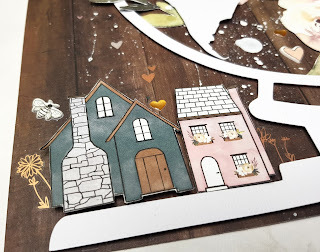 I popped the cut file and the houses up on some craft foam, to give some added dimension and interest. 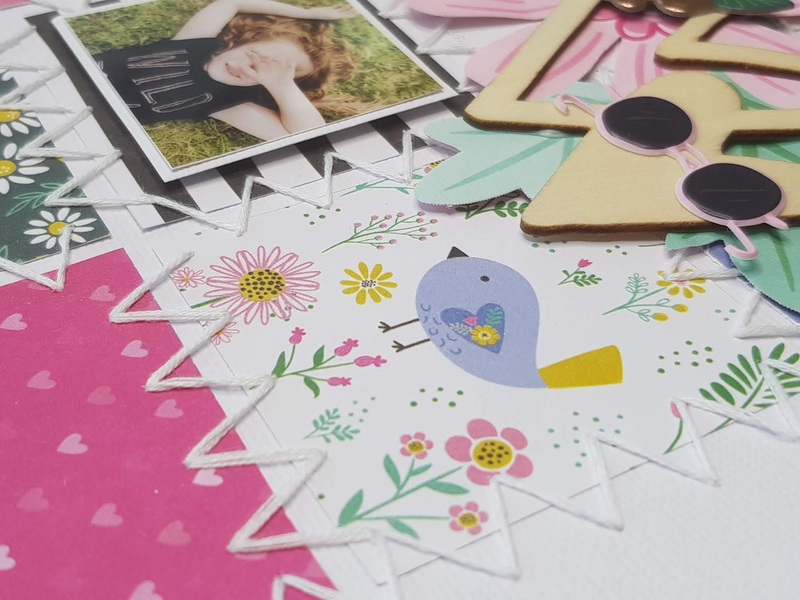 The rest is pretty simple really, I added some of the die cuts from the collection and used the beautiful floral chipboard Thickers for my title, which is simply just "Vienna". Here are some close ups of the splatters and the rub-ons. I have a process video for this layout, click here. 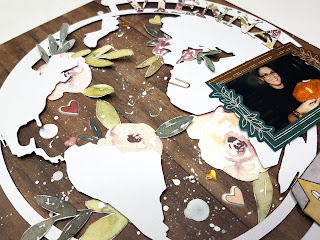 I used the new Rustic Floral Frame 2 cut file from the store. I cut the frame out of textured white card stock from American Crafts. I also resized to the file to fill a 12x12 paper. To help the cut file stand put from the background, I loosely doodled around the edge of the cut file with a black pen. For the background I was inspired to echo the hexagons in the cut file and I traced a small hexagon shape and stitched in a purple ombre effect, from light purple to dark purple. For the rest of the embellishing I basically just layered the floral ephemera and the die cuts from the Paige Evans Whimsical collection. If you are a stickler for PV's ( Process videos) please click here. Hello! It's Leslie on the blog today. I'm sharing my take on the Grid Lock challenge. I used the "Oh my Heart" collection from Paige Evans. There is a pattern paper from the 12x12 paper pad that has little squares of different patterns. I cut up the squares and used them as my base for my layout. For the back ground I used American White textured card stock, as the white of the card stock goes well with the white used in the collection. We all know how frustrating it can be when the collection and your white card stock are different whites! I chose to stitch the squares together with an almost messy zig-zag hand stitch. This I did with plain white embroidery thread, I used all 6 strands. here is a close up. I wanted to use four photos on this layout, so using a grid was very easy, I just placed one little photo in each of the four rows. I also matted the photos with white card stock, just to give them some extra pop. I also decided to pop them up on some foam squares. Next, I fussy cut out some of the beautiful florals from the collection and those served as my main embellishments. 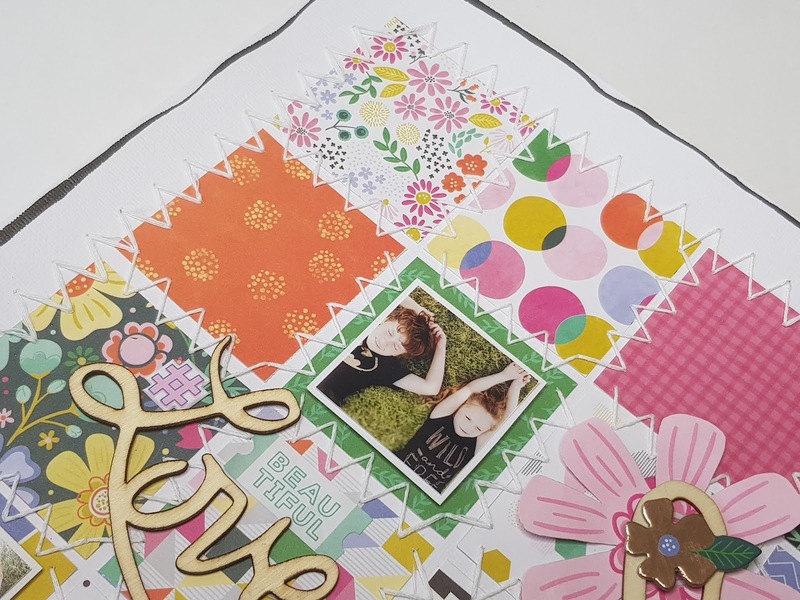 The layout was so busy with all the patterns and colors in the little squares I did not want to over do it by over embellishing the layout. I added two wood veneer pieces from my stash, The word" Love" serves as part of my title and a little ticket stub sticker serves as the other part of my title, " Beautiful Love". All in all this layout came together very quickly. Remember if you are in a scrappy rut, make a grid layout, it is easy, effective and striking, and not much thinking goes into it. Here are more close ups. For the Process video to this layout please click here. Hi! I had a free choice of cut files this week, so I chose the Tiny Stems Background. I loved the fact that it is so delicate and for me it resembles lace. I have been wanting to use my Felicity Jane Brooke Kit for ages and now I had the chance. I wanted to document a photo of my daughter of when she was 5. when asked what her favorite color was, she would always respond with a dreamy "Rainbow". I decided to make to cut file a full 12x12 page and cut it out on my Silhouette with Bazzill Marshmellow, card stock. I cut it out ones with a blade setting of 4 and a chose the double cut function, but that still did not cut through the paper. So I wasted a perfectly perfect 12x12 sheet of Bazzill Marshmellow. But then I changed the blade setting to 6 and still had it on double cut, and that worked like a charm! The cut file peeled off the mat beautifully! 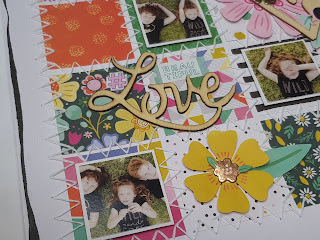 I layered the cut file over the rainbow paper from Felicity Jane and then I proceeded to embellish. I used some Studio Calico journaling cards for layering behind my photo and some paper from my stash. The rest is all Felicity Jane Brooke and Brie kit embellishments. I hope you found this inspirational. You can take a file and use it just like that, as a big 12x12 mat for your photo! I you would like to watch the Process Video for this layout please click here. My assignment was "Puttin' on the Glits". If you follow me you will know that I usually scrap by collection. I still have to make that shift in my brain that it is okay to mix collections! Weird, I know! But with this layout I made it a mission to do just that, mix collections! I used Pink Paislee Auburn Lane, Crate Paper Flourish and Crate Paper Wild Heart. I got it right to use three collections on one page! That is huge for me you guys! I fussy cut flowers from one of the sheets from the 6x8 paper pad and from one of the 12x12 papers from Auburn Lane. Those served as my main embellishments. I also pulled out a 6x8 sheet from the same collection to layer behind my photo. 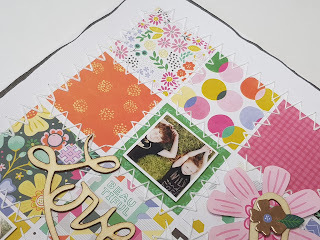 For the rest of the layering I used 6x6 sheets from the Flourish collection. 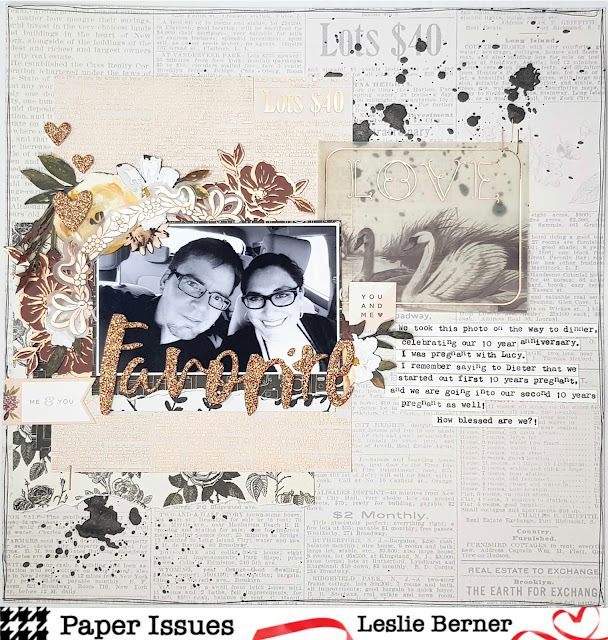 I also used two Vellum ephemera pieces from Flourish, with the swan vellum piece serving as the inspiration for this layout. I love the subtle sketchy and wispy nature of the little piece, and the rose gold would serve as a great 'Glits' addition. I also ventured outside the realm of the stark white background and chose a 12x12 patterned paper from Auburn Lane. It too has a very subtle print. So with all my elements carefully chosen the gluing began. The main 'Glits' on my layout is the title and the small hearts at the top left hand corner of the photo. These are from the Wild Heart collection, and adds just the right amount of shimmer and sparkle without detracting from the rest of the layout. I have scrapped this photo of me and my husband on our 10 year anniversary before, but there are no rules that state that you can only scrap a photo once! I don't journal on all my layouts, but I decided that I needed to tell a story in words as well as pictures. I used my WRMK Typecast and cut the sentences into strips and adhered them next to the photo. I felt that the background needed something more, so I splattered some Black Heidi Swapp Color Shine onto the background, I wanted the splatters to resemble ink splatters. Compositionally speaking, there are a few aspects to consider. The main area of embellishing runs across the page in a horizontal path, through the middle of the page. The swan Vellum piece is offset just a little above the main line of embellishment, encouraging the eye upwards to the top right hand corner of the page, thus I added the black splatters to the top right hand corner of the page and then to add balance to the page, I added black splatters to the bottom left hand corner of the page. Thus, the splatters adds a diagonal aspect to the composition. The eye is drawn from the top right hand corner down to the bottom left hand corner of the layout. The negative spaces in the top left hand and bottom right hand corners of the page serves as a balance to the diagonal line. Far from being negative spaces, these two spaces keep the composition together. If you, like me, are a stickler for process videos, please click here to watch my process on YouTube. I hope that you are inspired to add some sparkle and glits to your layouts, don't be afraid slap on the glitter pieces and never skimp on that gold!!! 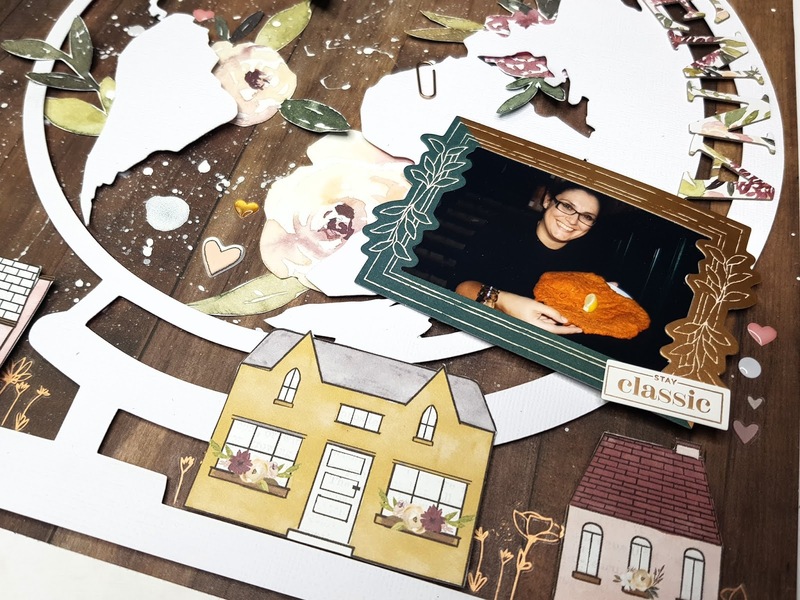 My assignment for today was to make a layout to do with Fall or Halloween, and I chose to do a layout about Fall, however, where I grew up we saw Autumn. I used the Fall Florals cut file. I filled a whole 12x12 page with the cut file and also resized them, so that I would have different sizes to work with in my layout. I had my Silhouette cut out the florals of Textured White American Crafts Cardstock. To resize the cut files I had to undo the compound path. Then I drew a bounding box around each individual shape and reselected it's compound path. This freed up each shape so that I could move it around individually and resize it as I saw fit. I used the new collection from Cat Martin called Norwegian Wood. It is a print and cut collection. I basically created a wreath around my 12x12 page with a combination of the cut files and layered the Norwegian Wood embellishments above and below the cut files. And that is that, not much else really, just a lot of layering!! If you are a stickler for process video like I am, click here to see the process to this layout on my YouTube channel. I am from sunny South Africa and now I live in the even more sunny Dubai, UAE. Dieter and I met at church and got married in 2007 and now we have four beautiful children! As well as having an obsession with all things scrapbook related, I also paint and complete the occasional mural or two!